remember that homemade taco seasoning we made? well, we're putting it to good use. we absolutely love tacos over at our house. typically we stuff our tacos with ground beef or ground turkey, but occasionally we like to stuff them with chicken too. when i came across a recipe for chicken tacos made in the crock pot, i knew that i just had to try it. the best thing about this recipe is that it is so simple. there are only three ingredients! you dump the three ingredients into the crock pot and then just walk away while the crock pot does all of the work. 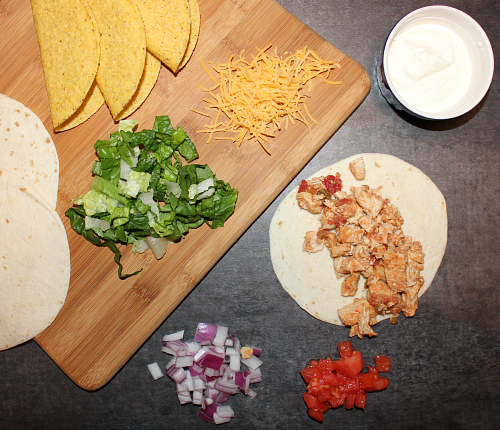 we made a batch of these chicken tacos and they fed us all week long! 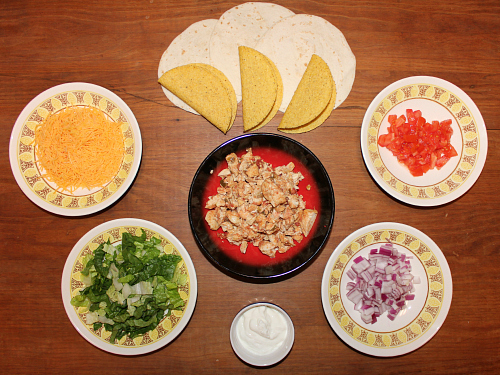 (in total we had enough chicken to stuff 20 small taco shells!) this recipe would be great for a party or for a large family. the chicken was not spicy at all. if you prefer your tacos with a kick, you can easily control the spice level in this recipe. cut the chicken breasts in 1 inch cubes. 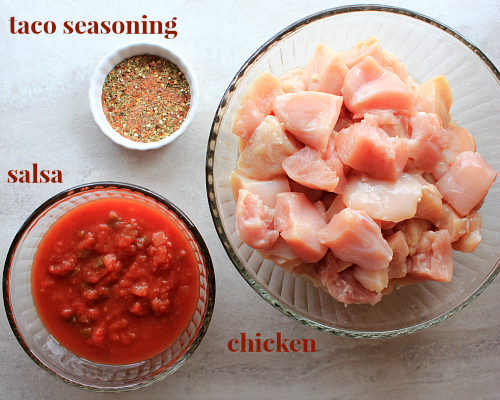 place the chicken cubes in a crock pot and add the salsa and taco seasoning. stir well to make sure that the chicken is evenly covered in the salsa and taco seasoning. cook for 3-4 hours in a covered crock pot on high heat. when the chicken is completely cooked throughout, shred the chicken with a fork. serve inside warm taco shells (hard or soft) with shredded lettuce, diced tomato, diced onion, chopped jalapeños, shredded cheddar cheese, sour cream, guacamole, and additional salsa. That looks real tasty, and done in a Crock Pot. I will also have to try that. I have not had a Taco in ages. I always enjoy how you set up your photos of food. You should be working for a magazine. These tacos sound good. I have not had a taco in years; you-know-who does not like taco type seasoning!